Don't Miss Steve Thomas' Keynote Tomorrow @ 8 a.m.! special emphasis on Builders Blitz and the ReStore. He recently completed three seasons hosting Planet Green’s Renovation Nation, which premiered June 4, 2008. He celebrated his final year as host of television’s most popular home improvement series, This Old House, during the 2002/2003 season. 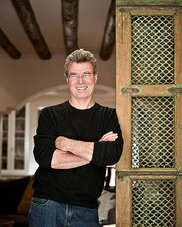 During his 14 years as host, Steve became known as the "ultimate home enthusiast" and helped catapult This Old House to the top of PBS’s list of most-watched ongoing series of all time. He also contributed to the successful debut of Ask This Old House, the all-new series in which viewer questions are addressed on-air, as host during its first year. Steve was honored with a 1997-1998 Daytime Emmy Award and a total of nine nominations for "Outstanding Service Show Host." He’s a popular speaker, video producer, writer, blogger, photographer, renovator and branding consultant. Steve consults on green, sustainable building and renovation for clients all over the United States. Steve Thomas will deliver the Keynote tomorrow morning at 8 a.m.! Visit http://www.naylornetwork.com/spf-conferenceDaily/articles/index.asp?aid=422965&issueID=56731 to view the full article online. The Exhibit Hall, featuring a number of SPF companies, will open tomorrow at 2 p.m.! Walk the floor and explore the various company booths, complete with industry professionals, tool displays and more! The Exhibit Hall will be open from 2 to 6 p.m. on Tuesday, with the Welcome Reception being held in the Exhibit Ball from 5 to 6 p.m., and 2 to 5 p.m. on Tuesday. View the SPF 2017 Convention & Expo brochure below for the full list of exhibitors! Visit http://www.sprayfoam.org/files/docs/2017/SF17_Attendee_Brochure.pdf to view the full article online. 40,000 sq. ft. and Specialty Applications (formerly Tanks &Vessels and Other). The winners will be announced on Tuesday during the 12th Annual Contractor Awards Luncheon in the Junior Ballroom at 12:30 p.m.
Visit http://www.naylornetwork.com/spf-conferenceDaily/articles/index.asp?aid=422964&issueID=56731 to view the full article online. Swing by the Hospitality Suite! SPFA will be running a Hospitality Suite tonight, Tuesday night and Wednesday night! Come by the Santa Rosa room at the Renaissance from 9-11 p.m. tonight and 10 p.m. to 12 a.m. on Tuesday and Wednesday night for networking and relaxation! Visit http://www.naylornetwork.com/spf-conferenceDaily/articles/index.asp?aid=422968&issueID=56731 to view the full article online. Welcome to the Sprayfoam 2017 Convention & Expo! It is with great humility and excitement that I welcome you to the 2017 iteration of the SPFA Annual Convention. Make no mistake about it, the show has become a central element of the sprayfoam industry, and has grown over 200% in the past decade. That's an average of 20% per year. Something most companies would be excited about. And I am, but I also recognize that our industry is growing faster than others, and it has its own challenges that we try to address in SPFA for the good of all. I hope that you take full advantage of all the show has to offer. Visit http://www.nxtbook.com/naylor/SPFQ/SPFQ0117/index.php#/6 to view the full article online. SPFA PCP Breaks Previous Record and Completes 73 Field Exams!! SPFA PCP is pleased to announce that 73 Master Installer Field Exams were completed over the past two days. On Sunday, 35 Field Exams were administered and today, 38 Field Exams were completed. The exams were divided between Roofing (38) and Insulation (35). Special thanks to all the dedicated SPF professionals who contributed to the success of this massive undertaking! Please be sure to thank all the sponsors who contributed financially to the Sig Hall Memorial Scholarship Fund and the Sponsors who donated equipment, material and supplies! Visit http://www.naylornetwork.com/spf-conferenceDaily/articles/index.asp?aid=422961&issueID=56731 to view the full article online. PCP Testing Practices Pass With Flying Colors! SprayFoam had a first.In accordance with ISO 17024, the certification process needs to be audited each year. This year, the audit was conducted on the delivery of both the written exams and the field exams. Improvements were made to the field exam delivery process this year, which drastically increased the amount of field exams that could be conducted. At the completion of the audit today, there were no major non-conformances, no minor non-conformances and no opportunities for improvement, basically a perfect score! These results reflect the hard work and dedication of all the people involved in the PCP process. A huge thanks to all those who helped achieve this. Visit http://www.naylornetwork.com/spf-conferenceDaily/articles/index.asp?aid=422969&issueID=56731 to view the full article online. Golf Tournament Results to Come! The Golf Tournament is wrapping up this evening, so the results of the tourney will be released tomorrow. Participants took a bus ride over to the tourney, which was held at the Classic Club! Visit http://www.naylornetwork.com/spf-conferenceDaily/articles/index.asp?aid=422963&issueID=56731 to view the full article online. Want to be sure you know everything going on during Sprayfoam 2017? A good start would be to check your inbox every morning during the show for our Convention Daily eNewsletter. If you are signed up to receive SPFA's bi-weekly eNewsletter, you will automatically receive our Conference Daily eNewsletter. Or sign up below. Visit http://www.naylornetwork.com/spfa/signup.asp to view the full article online. If you are posting images, feedback or notes about Sprayfoam 2017, be sure to include the #SPFAShow hashtage in your post. Including this hashtag in your post will ensure everyone else at the show who is following the events on social media will see it! Visit http://www.naylornetwork.com/spf-conferenceDaily/articles/index.asp?aid=422943&issueID=56731 to view the full article online. 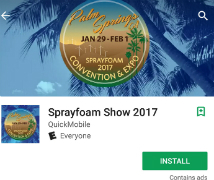 Be sure to download the SPFA Sprayfoam 2017 Convention App while you are at the show! Have the entire Convention in your pocket and all event information at your fingertips. This event app allows you access to everything you need to get the most out of your event! Search "Sprayfoam 2017 in the Apple App Store or Google Play Store. Visit http://www.naylornetwork.com/spf-conferenceDaily/articles/index.asp?aid=422944&issueID=56731 to view the full article online. Thank you, Sprayfoam 2017 Sponsors! It is thanks to these Sprayfoam 2017 sponsors that the annual SPFA Conference & Expo continues to provide top-notch learning, networking and education to professionals in all aspects of the sprayfoam industry. Visit http://www.sprayfoam.org/expo/sponsor-information to view the full article online.